Get effortless sophistication with this men's Chicago Slim Classic stainless steel case watch from Boss Orange. A sleek black dial with bold white Arabic hour markers and time hands makes this watch easy-to-use, whilst the brown leather strap provides this timepiece with a classic elegance making it perfect as an everyday watch. This watch is water resistant to 50 metres. 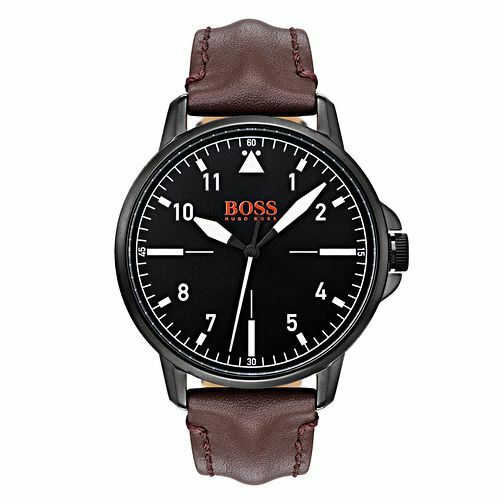 Boss Orange Chicago Men's Brown Leather Strap Watch is rated 5.0 out of 5 by 1. Rated 5 out of 5 by Anonymous from Great quality watch Bought as a present for my son, very good quality, and very happy with product and service.